Michelle Hong, 48, of Freeport was charged with criminal possession of stolen property and driving while under the influence of drugs on Sunday at 12:04 a.m. on Route 25 in Mattituck. She was arrested after police responded to a report of a person stealing a $300 fiberglass urn, a $75 iron hanging basket and a $55 bird bath from the Down Home Store in Cutchogue, police said. The officer on the scene located a 2009 Pontiac that fit the description of the suspect’s car, police said. After being stopped for failing to maintain her lane, Ms. Hong admitted to the officer that she was under the influence of prescription drugs, police said. * Cameron Gilbert, 26, of Mastic Beach was charged with unlawful possession of marijuana, resisting arrest and harassment last Wednesday at 10:57 p.m. after police attempted to arrest him for an active warrant from the Southampton Town Police Department, police said. * A 27-year-old Greenport man reported to police on Sunday, March 28, at 5:59 a.m. that two Hispanic males stole his 1992 Toyota Celica after he had warmed it up before work and went back inside his house on Fourth Avenue in the village for a few minutes, police said. While inside the house, the man said, he heard a car door close, looked out the window and saw the suspects driving away in the car, heading south on Fourth Avenue and then west on Route 25, police said. The officer on the scene checked along Route 25 but was unable to locate the vehicle, police said. The incident is still under investigation, said police. * Police reported a spree of motor vehicle larcenies in Mattituck during the early morning hours of last Thursday, April Fools’ Day. 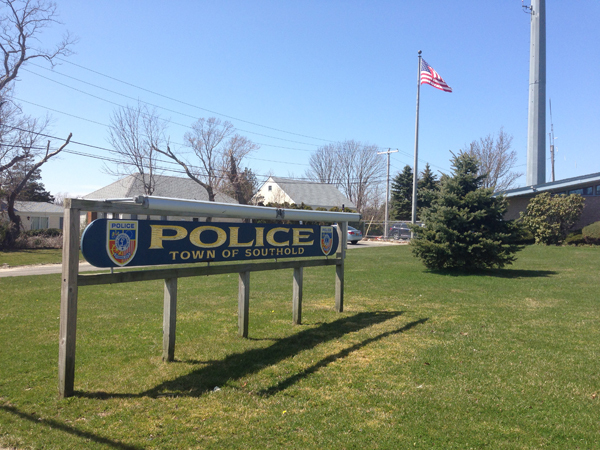 A 49-year-old Mattituck woman reported to police that morning that someone rummaged through all three of her unlocked vehicles parked on her Bayer Road property and an iPod was taken from one, police said. Three other Mattituck residents reported similar incidents that same morning, police said. A 57-year-old resident of Pike Street reported that someone “ransacked” his unlocked parked car, taking only his state inspection sticker. A 41-year-old resident of Freeman Road reported that someone went through her parked vehicle and took a spare key from her glove box. And a 56-year-old resident of Bayer Road reported that someone took $5 in cash, a pocket knife, a flashlight and a comb from his unlocked vehicles, police said. The incidents are under investigation, said police. * Gertrudys Lopez, 39, of Greenport was driving a 1996 Toyota east on Route 48 in Southold last Wednesday at 5:42 p.m., when she ran a red light at the intersection of Route 48 and Youngs Avenue and struck a 1999 Nissan driven by Carl Homan, 37, of Greenport, who was attempting to make a left turn onto Route 48 from Youngs Avenue, police said. Both drivers were transported by members of Greenport Fire Department to Eastern Long Island Hospital for treatment, police said. * Kenneth Cohen, 78, of South Jamesport was driving a 2008 Mercury as it left the Empire Gas Station on Route 25 in Mattituck on Sunday at 8:10 a.m. when he accelerated very quickly across Route 25 and struck a parked 1998 Pontiac across the street, then hit a house at 7355 Route 25, police said. Mr. Cohen told police that he didn’t know what happened and appeared to be disoriented, police said. Mr. Cohen was taken by members of Mattituck Fire Department to Peconic Bay Medical Center for evaluation, said police. Those named in police reports have not been convicted of any crime or violation. The charges against them may later be reduced or withdrawn, or they may be found innocent. Cameron Gilbert, 26, of Mastic Beach my neighbor in mastic beach. I think he’s a big time dealer the Cops lazy – did not get the big loot. He sells crack and meth.